The rash is the same whether you run afoul of the poison ivies, oaks, or sumac. This is general advice: if you have a bad rash, get medical help! Answers to general questions are here. If you don't find your answer, use our contact page to send your question. You think you might have just touched the plant? You have only about 30 minutes to get the plant oil off of your skin before it soaks through the outer layers. Wash in COLD water, right away, with lots of pressure, like from a garden hose. Avoid very hot water for watching as that may harm your skin and make the situation worse. Soap can also help spread the plant oil. Try to get RID of the oil with cold water and alcohol, then shower when you are as sure as you can be you got all the oil off of you. Don't touch your face or any other tender skin areas. While the oil has a hard time getting through tough skin on the fingers, it goes right into the tender skin of the face, eyes, and private parts! How long does it take for the rash to appear? It seems to take 8-24 hours for the rash to appear. But it depends on such factors as: how much oil you came into contact with; whether the oil got on areas of thin or thick skin; and your level of sensitivity. 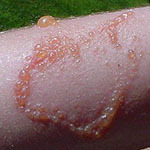 This variability is why the rash can seem to spread: it first appears where more oil got on the skin or where the skin was thinnest or scratched. Then areas with less oil or thicker skin start to erupt. Can I wash off the oil with Tecnu? Sure, if you have it with you. So keep some around if you think you are headed for poison ivy/oak territory. But remember that you have to wash off with Tecnu within a half hour or so; otherwise, the oil is already IN. Check out Tecnu. I also got an email from a viewer who had great things to say about Tecnu's Calagel for itch relief. 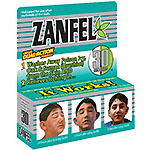 If you have a minor rash, go see what your drugstore has, such as Zanfel. 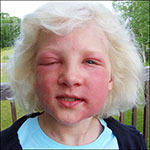 BUT if you have a bad rash with blisters or anything near the eyes or other tender parts: go see the doctor! There are prescription remedies for serious cases that only a doctor can prescribe. What about remedies like Zanfel? Many people get great relief from Zanfel, and it is easy to find. There is no reason not to try it. 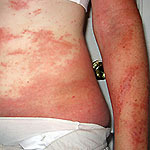 The rash seems to last 2-3 weeks, depending on how much a person is exposed and how sensitive they are. Look at the young fellow to the left; a rash this bad would take some days to get like this, then at least 2 weeks to get better. How can you stop the terrible itching? Heat, oddly, seems to stop the itching for a while. The safest way is to take the hottest shower you can stand. A hair dryer might work, but is more likely to burn your skin. People have said that deodorant with aluminum seems to help, and even if it doesn't this doesn't sound dangerous. This is one of those questions that causes lots of arguments. 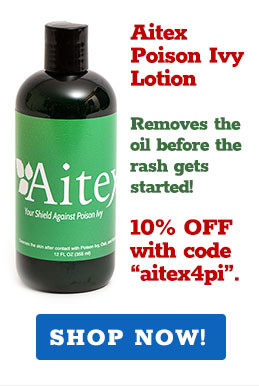 All doctors and books say that once the plant oil has been absorbed, the rash does NOT spread to others. And also: the fluid in the bubbles does not contain the plant oil. As a doctor told me, if you get a rash from an allergy to nickel jewelry, there is no nickel in those rash bubbles, either. 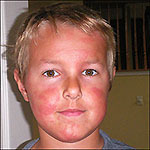 But here is a problem: suppose the person with the rash still has plant oil on clothing, a car seat, or a pet. 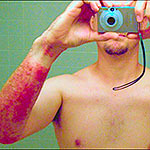 Then they can spread the rash because they are spreading the plant oil. Can a pet get the rash? Another question that people argue about! 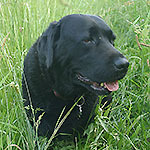 While many books and vets have said that no animal other than humans has been shown to have any problem with poison ivy, a vet tech recently told me that there is good evidence that dogs can get a rash on their bare skin. Their fur seems to protect them from the plant oil, but the bare belly can get a rash. Birds eat the seeds with no problem, and goats and cows eat the leaves with no problem. Might there be plant oil, urushiol, in the goat milk? Probably not much. Enough to cause immunity? Probably not known. But people CAN get the rash from the fur of an animal that has rolled in the plant, for sure. Can you get the rash through the air? 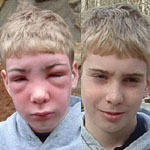 People have told me they are so sensitive that they get the rash every year without ever going near poison ivy or oak. They suggest the oil can travel through the air on a very hot day. I think it doesn't work that way. Only smoke from burning plants can travel through the air and affect skin, eyes, and lungs. What I think happens to people who get the rash every year at the same time is that they use the same tools, clothing, or furniture each spring or summer, and those items have the plant oil on them from prior years. That's my guess.